For most people, buying a house is a matter of both the head and the heart. Not only do the sums have to add up but we have to fall in love with the house too. But love is a fickle creature and all sorts of vague and random notions can influence us; a lovely view, a cosy fireplace, big rooms or a rambling rose arching gracefully over the front door. For Vita Sackville-West and Harold Nicolson, the presence of an ancient nuttery and an Elizabethan tower in the grounds of Sissinghurst were enough to make them fall head over heels, with Harold writing on April 6th 1930 ‘We come suddenly upon a nut walk and that settles it…’ Never mind the fact that the rest of the house was virtually a ruin and totally uninhabitable; they had fallen in love with a nuttery and the rest, as they say, is history. Their determination to buy Sissinghurst baffled the Surveyor who, having surveyed the whole dilapidated property, wrote in amazement ‘I understand Mrs Nicolson proposes to occupy this’. Initially, Vita and Harold planted the Nut Plat, as Vita now liked to call it, with a carpet of intensely coloured polyanthus, probably inspired by the Primrose Garden at Munstead Wood, the home of Gertrude Jekyll. The mass of bright yellow, red and white flowers created in the 1930s was described by Harold as: ‘the loveliest planting scheme in the whole world’ and ‘the company of the bright and good’. The Nuttery underplanted with polyanthus. 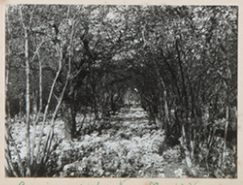 The Second World War inevitably led to a decline in its maintenance but as soon as the war finished and Harold returned to Sissinghurst from London, he wrote: ‘I am determined to make MLW [My Life’s Work] the loveliest spring border in England and then to make the Nuttery what it was before. If I succeed in this I shall die happy’. Did he succeed and die happy? 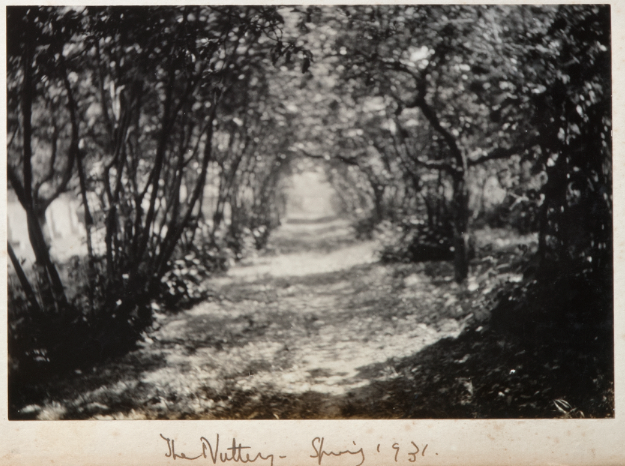 Certainly the Lime Walk became ever more beautiful and Jack Vass, Vita’s Head Gardener worked hard to restore the Nuttery to its former glory. Unfortunately, that glory was not destined to last. For a few years, the Nuttery flourished but by the early 1960’s it was clear that all was not well. Storm clouds of doom were gathering on the horizon for the polyanthus as one by one they began to die. The symptons were diagnosed as being caused by ‘soil sickness’, a condition that occurs in soil when harmful fungal diseases build up, due to growing the same plant in the same place for many years. [Primulas being particularly susceptible to this condition.] But still the gardeners battled on using all available weapons to beat the soil sickness including chemicals, tonnes of organic matter, grit and new polyanthus. Initial success gave hope for the future but it was short lived and by 1974 the gardeners had to accept that no amount of interventions would save the polyanthus; there was simply no permanent solution. Thus, out of the flames of failure arose a new and even more beautiful planting scheme. This is the Nuttery that we know and love today. A cool, restrained pallet of colour consisting of green, white, lime-yellow and blue. The plants are all woodland plants, chosen to thrive in shady conditions and to mingle happily together in ever changing patterns. However, in order to achieve the right balance between shade and sun, Pam and Sibylle, (the Head Gardeners 1959-1991) realised that some of the hazels needed to be removed. In a bold move they removed every other row of hazels and then removed alternate trees in the rows that remained, leaving 56 in situ. Light flooded in and an area that Sibylle described as ‘very dark and very dry’ was transformed. They rotavated between the rows and set about planting the ‘new’ Nuttery with suitable woodland plants. These are the plants that are still flourishing today with many of them forming significant and mature groups. Small woodland plants such as Anemone nemorosa, primroses, cowslips and violets (Viola riviniana Purpurea Group) emerge first in spring giving the Nuttery a simple and beautiful cover. As Spring progresses, this develops into an increasingly elaborate tapestry. Colour builds with the addition of acid yellow from Euphorbia amygdaloides var. robbiae and Smyrnium perfoliatum; lime green from the Veratrums, Matteuccia struthiopteris and Onoclea sensibilis and deep blue from Omphalodes cappadocica ‘Cherry Ingram’. White is sprinkled throughout, like a light dusting of icing sugar, with the addition of Smilacena stellata, the white form of Spanish bluebell, Polygonatum odoratum ‘Variegatum’ and Trillium grandiflorum. Several varieties of epimediums also thrive in the Nuttery including E. x versicolor ‘Sulphureum’ and the stunning red Trillium sessile form stately groups throughout. By high summer the over-riding colour is green with eye-catching bursts of colour from Lilium martagon and Dactylorhiza x grandis. The beauty of the Nuttery is that the planting is not static. From year to year the tapestry of plants subtly changes; like the ebb and flow of the tide. The skill of the gardener is to ensure that none become an overwhelming flood that swamps the others. Smilacena stellata for example, will always need to be reined in but many can be left to their own devices or gently diverted back to their allotted space. Every plant plays its part in this symphony and there is not one that is more important than the others. The magic is in the way they look together. As Aristotle said: ‘The whole is greater than the sum of its parts.’ I’m not sure he was referring to a Nuttery but it’s a fitting description. And what would Vita have made of the new planting scheme? Would she have liked it? Yes, I think she would.